Over a thousand people were asked if they have any specific savings strategy, such as saving a certain percentage of income. Over 54% replied that they did not have any strategy at all. 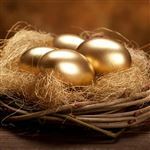 More worryingly, 61.5% said that they are not saving for retirement. This lack of strategy is not due to a lack of awareness of the different types of investments available. 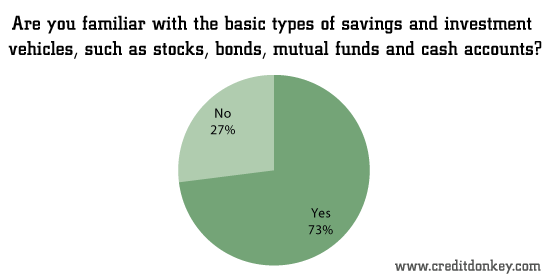 Nearly three-fourths (73%) of respondents said that they were familiar with stocks, bonds, mutual funds, and cash accounts, and 65% said that they knew where they should be putting their savings. However, respondents are finding it difficult to translate their knowledge into action. "One of the biggest problems with personal finance is that costs keep rising," said Charles Tran of CreditDonkey.com. "Over half of the respondents to this survey make less than $50,000 per year. After taxes, the high cost of oil, food, health insurance, and college tuition means that saving money is harder than ever." Health insurance premiums have more than doubled since 2000, according to the non-profit group Keaiser Family Foundation. Whereas a family spent just $6,438 for health insurance premiums in 2000, that figure ballooned to $15,745 in 2012. Meanwhile, workers' wages grew just 19% to $41,673, according to the Social Security Administration. "High costs and low wages mean saving is harder than ever before," said Tran. "Americans are finding that they need to make more and more sacrifices just to make ends meet, and one of the first things to go is saving for the future. While this is a national crisis for several reasons, there is no reason to expect it to stop anytime soon." 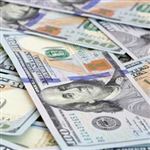 Close to half have no cash savings and are living on the edge of financial disaster, according to a recent CreditDonkey.com survey. 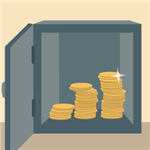 While 59% of respondents reported having more than $500 in savings, the other 41% do not have a cash safety net. Leave a comment about Survey: Saving Money Statistics? Share on Facebook "Survey: Saving Money Statistics"